It turned to be a lot of fun and downright cheeky! 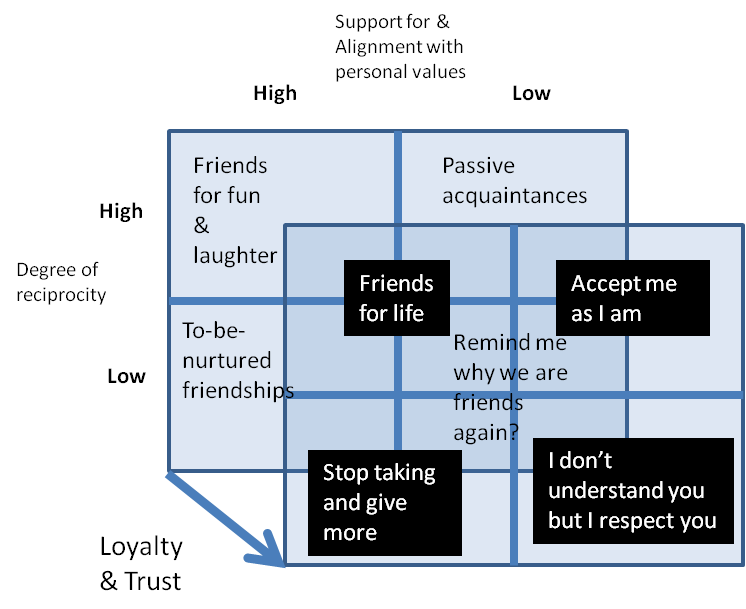 I used an idea from the 3D HR model by Gratton & Truss (2003) to build a friendship grid. Mind you, this grid is rather personal but I think many folks will find it useful as you can add and subtract as you please. There are a total of 8 segments with only 4 moving to the third dimension (a dimension of commitment, if you like) of loyalty and trust. Yes, you don’t have to trust everyone in quite the same way. I always think that with some modification to the grid, dysfunctional romantic relationships can be sniffed out! The horizontal alignment is based on common values and support for each other. Vertical alignment is based on mutuality of the friendship. Is one person doing all the work? I’ll break down what I’m thinking at the risk of being burned at the stake. They are great fun to be with and they put you in a good mood. But there’s no psychological contract of loyalty and commitment. The misunderstanding comes when you start to have high expectations of these folks. Saying things like, “But she should have done this or known that.” No one owes anyone anything. In a way, it keeps things simple. One person is doing all the work here. If that person is not me, this is one friendship I need to nurture. Perhaps some efforts from my side will lead to some kind of trust and loyalty. It may have something to do with past upsets and/or betrayals. But who knows where life will take us? We are always pleasant when we meet in parties, school pick-ups etc. But it really ends there. No hard feelings but you don’t know me and I don’t know you. Or maybe I do know you and I find we don’t have much in common. It can be argued that people like this should not be on the grid at all but I think that’s unfair to say. There are those that are in your life for whatever reason e.g. through a mutual friend, in-laws etc. You go out of your way for them because maybe there are related to you or to someone you know. They think they deserve it and you play along. Hmm, I’m beginning to see that “friends” may not be the right word here. Any ideas? This speaks for itself. You’ve been through thin and thick together even if you don’t see them often, they know you and you are comfortable around each other. You don’t always agree but you always know they would never disrespect you intentionally and will support your dreams as you support theirs. For instance, I had a close friendship with someone that I only ever met once over 5 years! We talked over the phone and are still good friends now. This is a stern instruction. Someone is loyal and trustworthy but the other is taking it for granted. If this is me, woe is me. I need to identify those who love me and love them right back! However there are folks here that used to be “friends for life” but perhaps distance and lack of “active” forgiveness has reduced the willingness to exert more than the minimum effort. We understand each other even if we don’t think alike. If the differences are so fundamental maybe I shouldn’t be here in the first place. If they are not fundamental however, accept and proceed. A loyal friend is hard to find and I am not really looking for a splitting image of myself (shock! horror!!). Often those who you don’t completely get. But you respect their stance in life. Hell, you may even admire them. You wouldn’t go to them for advice (unless you want the absolute undiluted truth) but it may be good to look at someone different from you once in a while. These folks tend to be much older than me and have seen many phrases of life. I aspire to have their grace and confidence but at this stage in my “growth”, I have to admit that I often don’t understand them but respect that they have come a long way. *Note: I use You and I interchangeably. It’s just me generalizing and then talking some sense to myself in the same breath. My list is not exhaustive but the main result of the audit was that it highlighted that she had different categories of friends. They just fell into groups. There were friends who she would run to if she had a problem in her marriage or with one of her kids. There were those she would ask to pray with her. There were those who she only had a good laugh with but wouldn’t confide in them at all and so on. There were also friends that made her uncomfortable, perhaps because they were judgemental and put her in positions where she felt that arguing and displaying her opinion would just cause a fight. She often left feeling as though she was party to something she would rather have nothing to do with. Anyway, I remember thinking that I owed myself a friendship audit. I desperately need to do one but I haven’t. I think it will be revealing and will probably prove right certain things I already know, to be honest. Personally, I think it’s okay to have different classes of friends. It’s like market segmentation. You can be different things to different people. I cherish my friends that give me a good laugh even if I can’t confide in them about my challenges. That’s okay. I pray for those who listen to my ramblings about my insecurities because they deserve life’s very best. Well, we’ll see what mysteries my friendship audit reveal. Watch this space. 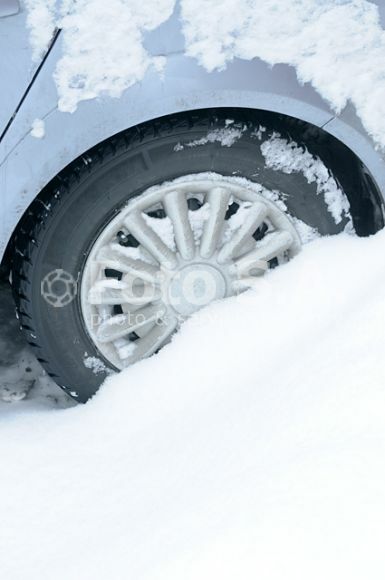 There was a 4-hour wait at the only shop in Aberdeen that had snow tyres yesterday. Even though I got to the shop an hour before opening, I still wasn’t first on the queue. Well, I have them now and it’s great because I’ve been having very close encounters as my car dances and swinging left and right when I get into my street. People have been asking me whether the new tyres make a difference and my answer is unequivocally YES! I feel safer and most importantly, my brakes seem to work on the highway. Please feel free to add to my list. Corporate Social Responsibility brownie points. Promoting safe driving because people will be more inclined to get snow tyres therefore reducing accidents in winter months. Potential sales volume increase. This is possible because although you are cutting prices, the NUMBER of people switching to insurance companies that reduce premium for snow tyres will INCREASE. Multiply volume by price, you could have REVENUE increase. Premiums can of course go back to normal in the summer. Steal market share. The insurance business is big business. It is largely an oligopolistic market i.e. few sellers, millions of buyers. So being the first on the scene is everything! It’s a fabulous opportunity to steal market share even just initially, before everyone copies you :-). But there’s a crown for being first. Customers are likely to come to you unless of course, the competitor’s counter-move is better e.g. even lower prices, cash back and whatever they think it takes to push back. I’m sure there are more benefits of this approach but I have other things to do today. So if you know any insurance people, could you please ask them why they are increasing premiums for changing to snow tyres or refusing to pay out when an accident occurs (an accident that would have been fatal without snow tyres)? I’m intrigued. It’s on countless products in the grocery store: 99p, £9.99 etc. That’s psychological pricing. They want you to think the product is cheaper so you see 99p and you think: ‘Wow, it’s less than a pound! Well, my current problem is quite the opposite. I have been working on increasing sales of a particular software product through aggressive selling but the efforts are not equalling the results. What I’m finding increasingly shocking is that my customers think the product is too cheap and would rather buy the more expensive products! Actually, it makes sense. But is this always true? Can a company not enter the market selling at rock bottom prices and go on the win market share? Maybe. It depends I think on the type of market. For instance, if it is highly competitive like retail, price sensitivity becomes very high and many customers will for buy at Asda not Sainsbury based purely on price. Of course, it’s not only price that matters. One should consider customer service, quality, support, ease of returns etc. Also there’s this strange thing about wanting to do what everyone else is doing….. What brands are my friends buying? Anyway, for my dear product, I will need to roll my sleeves up and do the following to arrive at a plausible pricing strategy. Segmentation analysis. Classify my customers. What is their behaviour and attitude towards my product? Who among them are promoters? Are their any detractors that will not repurchase or refer others to me? Why? Does it have anything to do with price or is there much more? How can detractors become promoters? Competition analysis. Look at what the competition is charging and then evaluate market share distribution. How low is my price compared to the average price paid by customers? Is it really about price or is the competiton actually just…better (ouch!)? Communication, communication, communication. I can’t increase price without telling the customers why. And it has to be done right! There are a dozen ways to do this e.g. through sales ads, conferences, press releases, exhibition, free trials etc. Most importantly, there has to be an internal positioning statement that tells employees what space in the market this product is occupying. This bit is tough. It will also cost MONEY……. There has to be a budget in place, maybe based on % increase in sales anticipated from the price increases but they are other ways (Kotler et al (2009) has some ideas). Engaging the team. People are your assets. If they don’t engage and empathise with customers to make this happen, you’re screwed. I’m screwed. Incentivise, give bonuses whatever- just make it happen. Many times it’s a chicken and egg scenario. People don’t want to put in the effort because they don’t believe it will yield great results. But if they don’t put in the efforts, there will be NO great results!